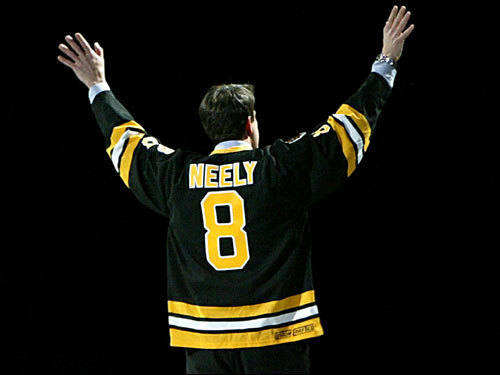 Bruins great Cam Neely enters the Hockey Hall of Fame on Monday, but his greatest legacy has been established off the ice. The Cam Neely Foundation for Cancer Care has raised nearly $15 million US for cancer programs at the New England Medical Center in downtown Boston since its inception in 1995. There's a bed-and-breakfast style home away from home that accommodates several families each week, there's a research laboratory, and a bone marrow transplant unit is to open this winter. "From my point of view, the importance of what my foundation has been able to achieve in the 10 years and how many patients and families we've been able to help certainly outweighs any kind of honour I've received for playing hockey," Neely said during a Hockey Hall of Fame conference call Thursday. It is his work with families dealing with cancer that shines even brighter than his hockey accomplishments. Neely lost both parents to cancer, so he dropped the gloves against the disease and opened the Neely House at Tufts-New England Medical Center. Since August of 1997, the Neely Foundation has helped more than 3,000 families cope with the devastating effects of cancer. The Neely House is a bed-and-breakfast-style home where families can stay in comfort and help each other deal with the life-changing issues while the patient undergoes treatment. It is within those walls that Neely's legacy is much more important and much more appreciated than scoring 50 goals in 50 games. Your $20 donation funds one night for one family at The Neely House at Tufts-New England Medical Center. Inter-Galactic Jester gathers some quotes about Neely. Harry Sinden's is good: "Maybe Gordie Howe comes to mind. With Lemieux and Gretzky, as great players as they were, they didn't hit anyone and no one hit them." Some of Neely's greatest hits are presented by BroadStreetBully.com.